As investors, many of us have traditionally been taught that bonds and other fixed-income instruments are “safe” investments. They have acted as safe havens in times of distress in the equity markets. Bonds have traditionally been thought of as so safe that many financial professionals look to them during a time when investors need safety the most: their retirement. Younger, more conservative investors planning for retirement are often placed in portfolio allocations such as a 60/40 blend that consists of 60% stocks and 40% bonds. The bonds are in place to add “safety,” while still contributing to overall portfolio returns. However, when evaluating the true risks of bonds, safety is the last word that comes to mind in the current market environment. Over the past few decades, the bond market has seen arguably the greatest bull run in history. Interest rates on the 10-year Treasury have fallen from a high of 15.84% in 1981 to a low of 1.46% in July 2016 (based on 10-year Treasury constant maturity rates from the St. Louis Fed). This falling rate environment has been near picture-perfect for bond investors. The recency of this bond bull market can leave investors with a false image of the risks of bonds. Falling interest rates have given bonds the optimal environment to invest in over several decades. However, this environment is coming to an end. 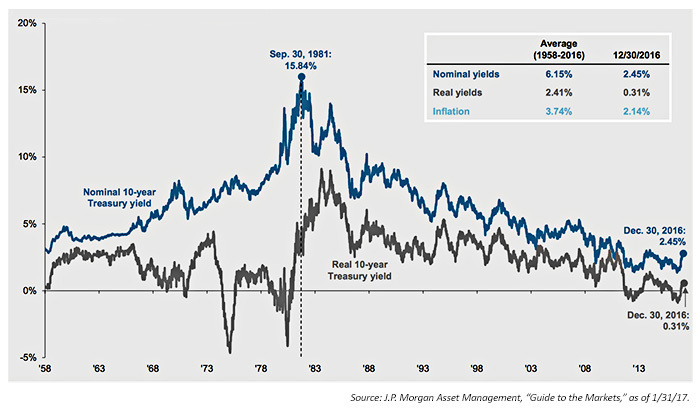 As shown in Figure 1, interest rates hit the lowest “real” yields for the past several decades in late 2016. There has been movement higher in the post-U.S. election period, and most analysts do not expect a revisit to the lows of 2016. While the experts have been proven wrong before, odds are that the great bull market of bonds is coming to an end. When thinking about risk, most investors and financial professionals take too narrow a view. They often think about risk only in terms of short-term losses. For example, equity markets are thought of as risky because they have had periods where drawdowns exceeded 50%, most recently in the 2007–2009 credit crisis. However, short-term risk is only half of the discussion. The other half is long-term risk. Long-term risk is the risk of your investments not producing enough return to outpace inflation and achieve your growth goals. Stocks have historically had relatively low long-term risk because they have consistently outperformed inflation. So, the question becomes, where do bonds fit in comparison? First, let’s tackle the short-term risk side of bonds. According to J.P. Morgan Asset Management analysis, a 1% rise in interest rates will have a drastic impact on the future returns of bonds. As shown in Figure 2, a 1% rise will cause the 10-year Treasury to lose 8.5%. In fact, if bond yields were to rise from the current rates back to the 1981 high of 15.84%, especially over a relatively short period, the negative impact on bond prices would obviously be an extraordinary event. Proponents of bonds will tell you that we have seen rising interest-rate environments before (from the 1940s to the 1980s), and the short-term risks of bonds stayed relatively low. In fact, the max drawdown of bonds has stayed below -12%. This is on a nominal performance basis only. On a real return basis, the data tells a different story. When looking at bond performance (and investment performance), too often investors look at nominal performance. This is the performance without considering factors such as inflation. For instance, if your investment portfolio rises from $100,000 to $110,000, your nominal performance is 10%. However, if inflation was 6%, your nominal performance now drops to 4%. Because bonds have historically been shown to produce lower returns, inflation has a larger effect on bonds in comparison to stocks. Including inflation in the max drawdown calculation produces the real max drawdown. In Figure 3, you can see the comparison between the real and nominal max drawdowns. As seen in Figure 3, even on a short-term basis, bonds have been shown to carry significant risk. The real max drawdown of the 10-year Treasury was over 60%. 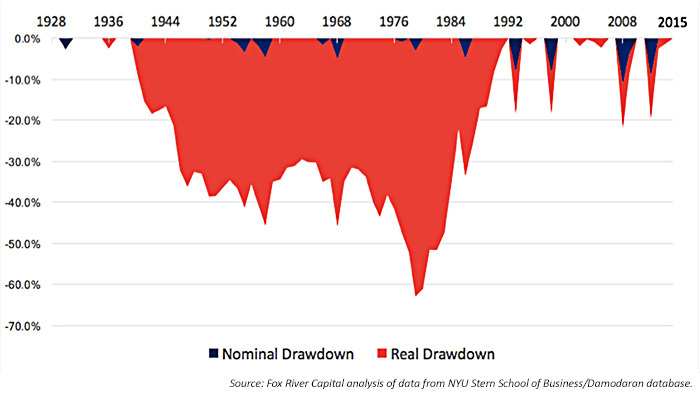 This max drawdown period started in 1941 and peaked in 1981. Interestingly, interest rates hit what was then an all-time low in 1941 and an all-time high in 1981. When thinking about the risks of bonds, even in the short term, it is important to think in terms of inflation and purchasing power. If we don’t, bonds appear to be “safe.” However, this is only on the surface. Now let’s look at the long-term risks of bonds. Again, the long-term risk of any investment lies in not outpacing inflation and providing necessary growth for the investor, rather than a temporary short-term drawdown (painful as that may be). The average annualized return of bonds from 1928 to 2015 is 4.96%. For conservative investors seeking steadier returns with lower volatility, this has proven to be a satisfactory alternative. $1,000 invested in 1928 would be worth $70,618.88 today. 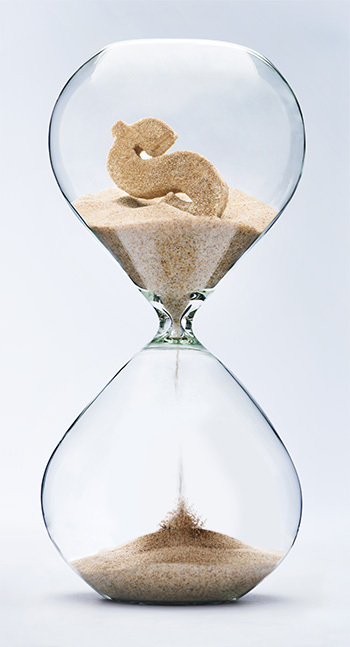 Similar to short-term risks, many bond investors miss the hidden risk that plagues the longer time frame. Looking at the real annualized returns of bonds from 1928 to 2015, we see they have averaged only 1.78%. In terms of purchasing power, your $1,000 would have only grown to $4,133.39. Take this analysis one step further. In a rising interest-rate environment, like the one from 1940 to 1980, real returns of the 10-year Treasury averaged -2.00% per year. At a time when interest rates are near all-time lows, many market professionals agree that a slowly rising interest-rate environment is to be expected going forward. This means the outlook for overall bond prices going forward into the future is questionable at best. Yes, there are strategic and tactical ways to manage fixed-income investments in any interest-rate environment. But a buy-and-hold bond strategy, especially using conventional bond funds, will likely produce substantially lower total returns in the next 20 years than over the past three decades (paraphrasing the findings of a 2016 McKinsey study, “Diminishing Returns, Why Investors May Need to Lower Their Expectations”). Where can conservative investors go from here? According to J.P. Morgan Asset Management, the 10-year Treasury was delivering a negative real yield at times during 2016. In February 2017, 10-year real yields had moved up to a still-anemic level of 2.45%. What prudent investment options do advisors have for retirees or more conservative investors if bonds cease to be a safe haven? First, I would make sure risk is being defined properly. Most retail investors focus too much on the short-term risks of investing and not enough about the long-term risks. For instance, although stocks have been shown to have high short-term risk, they have historically had very low long-term risk. Second, help your clients to stop thinking about investing on such a narrow time scale. Most investors that are starting to retire think they need to be ultra conservative to preserve what they currently have. For an investor retiring at 65 years of age, the current life expectancy is approximately 85. That is a 20-year time horizon that they will need to make their income-producing assets last. One in four retirees at 65 will live beyond 90. The time horizon is much longer than most retirees think. This means that retired investors will still need to sustain a large enough return to outpace inflation and replace withdrawals from their retirement accounts. Bonds will likely be a poor solution to this dilemma moving forward. True diversification means going beyond the traditional 60/40 stock-to-bond blend. In fact, true diversification has three tiers to it, as I explain in basic terms to clients. The first is diversification within asset classes. This is the traditional idea of not putting all your eggs in one basket and instead spreading them out among multiple alternatives within an asset class. For equities, this could represent different sectors, geographies, and company sizes. Next is the use of different asset classes. Stocks and bonds are obviously only two classes. Commodities, currencies, private equity, and real estate are just a small taste of other asset classes and alternatives that you can use to further diversify. Finally, you can diversify with different strategies. In this article, we covered some of the dangers inherent in buy-and-hold stock and bond strategies in terms of drawdowns. However, buy and hold, or “long only,” is just one strategy. There are hundreds of other strategies, such as momentum investing, value investing, managed futures, mean reversion, pairs trading, statistical arbitrage, and so on. Using only one strategy in your portfolio is limiting your investments to only one dimension of potential performance in the markets. Using multiple strategies also can help in times of market stress, when, as seen in 2007–2009, virtually all equity sectors moved down in unison, as well as high-yield bonds, real estate funds, and many commodities. The dynamic and active management side of investing differently is simple in concept, while sophisticated in practice. It means investing with a professional or team of professionals that can actively direct and monitor all or part of a client’s investment portfolio. These experienced third-party managers aren’t simply investing in the market hoping that investments will grow. Rather, they have decades of research backing their approach. They can both protect and maximize the growth of a portfolio through the multiple diversification tools previously mentioned, as well as layering in sophisticated risk-management analytics and algorithms. They have the ability to actively seek out sectors, asset classes, and strategies that are most appropriate to a given market environment. They can also monitor and adjust market exposure levels and have defensive tactical options within declining markets. Passive investing, as I tell clients, is the equivalent of putting your family in a car, telling them to meet you at a spot across town, pointing them in the right direction, and then taking away the steering wheel. They might start out on the right path but, without the steering wheel, they will quickly move off course. Active and dynamic investing, as practiced by professional money managers, is the equivalent of arming your family with the latest GPS technology, constantly updated weather and traffic reports, and a first-class vehicle that can be easily maneuvered to handle all sorts of road conditions along an optimized route. While there are no guarantees of any investing approach working ideally at all times, which mode of travel (or investing) makes the most sense to you and your clients?